Arts, architecture and legacy may seem like big ideas but they can be exciting ways for a community to rediscover its aspiration and potential. Our latest newsletter looks at how Big Local areas are shaping the future. 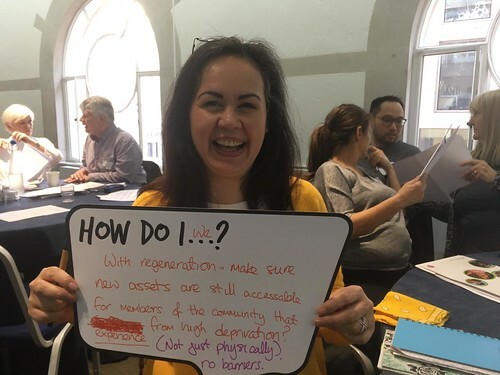 What happened when ten Big Local areas went to London to meet arts funders and practitioners at a discussion event co-hosted by Local Trust and the Calouste Gulbenkian Foundation? Read the blog. Local Trust and NLGN are conducting a research into the challenges and future relationship between councils, local communities and Big Local areas. As part of this research we will be holding a workshop to explore these issues. We encourage Big Local partnerships to join the discussion by signing up to this workshop on Friday 8th of June at Birmingham Library from 11am to 4pm. Please send an email to rsvp@nlgn.org.uk to book a place. We recently completed the third annual partnership review and found, among other things, that women are taking the lead across Big Local and every partnership is as different as its area. Find out more.